The C1V-WF Retro Diner Chair features an upholstered curved back, with 2″ waterfall seat pad, contrasting “V” color, and chrome finish. The C1V-WF is available in your choice of standard and designer vinyls. 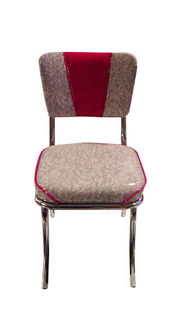 This model is one of our most popular retro diner chairs, reflecting the nostalgia of the Fabulous Fifties! Pricing for our Retro Diner Chairs is based upon the Grade of vinyl you select. For detailed pricing information on our retro diner chairs upholstered in your color selections, give us a call at 304-728-0547. You may also speak with our experienced representatives via our Chat Feature, or send us an email and one of our retro specialists will respond as soon as possible. We offer extremely competitive commercial customer discounts when ordering in large quantities. Let us help you build your diner or retro restaurant.